By the time the Summer finally arrives, so will Botonique Blush, its perfect counterpart! Imagine the crisp dry refreshment of Botonique original, but a touch lighter and with delightful notes of strawberry, rose and bramble - and plenty of sparkle. Fruity, refreshing and complex with a dry finish. The best of the British Summer, in a glass! Through the Spring, we’ve shown the prototype of Blush at various events including Vegan Live, Meg Matthews’ glitterati-packed event at Home House, James Ingham’s Jog On Top Cancer fund-raiser at the Cafe de Paris, and a Womens’ International Day party thrown by the Guardian. It’s gone down a storm in all these environments. Even those who don’t like Crisp Dry White (yes, they exist!) seem to love Blush, and those who are fans of the original like Blush too. So we are confident Botonique Blush will give you great pleasure as well as its health benefits. 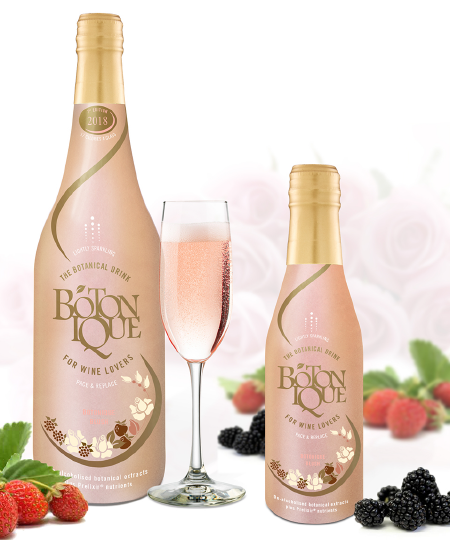 Due for release at the end of June 2018, Botonique Blush will be available in two sizes – 750 ml and 250 ml. Be sure to get you hands on some of the first edition, before it runs out! Expect our signature healthful hedonism – luxurious, contemplative drinking that is actually good for you! Negligible calories, packed with things that are healthy, and nothing that’s bad.